There is no brand that is quite as on the ball as Stig when it comes to game-changing innovation that is going to completely rearrange what you thought was even capable.This Disposable Pod Device by Stig contains three pods that are each filled with 1.2ml of juice in the flavor Lush Ice by VGOD Tricklyfe E Liquid and have a nicotine strength of 60mg. Made with salt nicotine, every inhale that you take is going to give you that satisfaction that you long for in the snap of your fingers. This draw activated unit features a built-in, low wattage battery that is going to last just as long as it takes for you to get through all of the juice that is held within this mod and offer a compact, easy to use option that is going to come in handy on those days where you need a mod that is going to be able to keep up to your busy schedule. 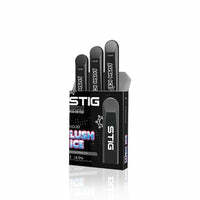 Lush Ice Stig Disposable Pod Device - Stig has a rating of 5.0 stars based on 1 reviews.